It’s durable, pliable, waterproof, lightweight, often transparent, formable, buoyant, strong, recyclable, and pretty cheap to make. It’s everywhere. It’s products. It’s packaging. Plastic is fantastic! – Wait a minute. Suddenly, it’s garbage. And it’s a lot of garbage. It’s a lot of problem garbage. For all the benefits of a versatile material, plastic waste is a major part of the recycling stream. A lot of plastic products and packaging are made for a very short (disposable) lifespan. This makes sense for applications like emergency aid, sanitation, and safety. The convenience economy still promotes disposal with an eye towards sales and not to waste problems. And short life or long life, when we’re through with it, plastic persists. The forlorn image of plastic bags caught in trees and bushes is just the beginning. Some plastics remain solid and some become brittle and crumble into small pieces. They are carried by wind and water. Some sink and some float. Some leach particles from their surfaces. They are problems for animals (wild and domestic) through consumption, suffocation, and entanglement. Plastic does not biodegrade. Plastics are convenient, but they do not work their way back into the environment in a helpful way. It’s apparent that we need to throttle the supply of this material and also recapture it for recycling. Many plastics have a number code printed on them. It’s usually a number between 1 and 7 inside a triangle with rounded corners. These numbers identify the resin used to produce the plastic but they’ve become pretty helpful in sorting plastics for recycling. The TS has bins to keep them separate. Not all plastics have these codes. 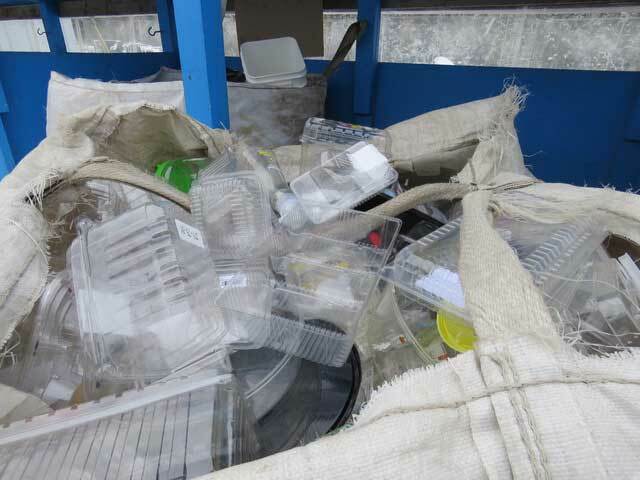 If there is no code, they go into either the “Hard Plastic” or the “Soft Plastic” bins. All plastics are recyclable. Plastics are convenient, but they do not work their way back into the environment in a helpful way. PlasticFreeJuly.org is a worldwide movement to become ‘plastic conscious’ by abstaining from any single-use plastic. It’s absolutely astonishing how much plastic comes into my home. Plastic film and wrap; re-sealable bags with dry goods (from cookies to seaweed); bottle seals, tops and lids; six-pack rings and holders; cheese and processed meat wrapping; dairy containers; bread bags and ties; vitamin bottles; pet food bags; paper towel and toilet paper wrapping; frozen fruits and vegetable bags; salad and bakery “clam shells”; almost every single product in the bathroom and medicine chest – it goes on and on. And that doesn’t include products themselves, like this keyboard I’m using and tools and hardware. Most of it can’t be re-used easily. Campaigns like Plastic Free July or those of the local group, ZeroWasteYukon.ca, are good for building awareness of how prevalent plastic is and how it is involved in so many consumer transactions. Danny Lewis, the Education Coordinator at RavenRecycling.org, pointed out to me how we tend to grimace when we see a huge pile of plastic containers in bales and bags at a recycling centre, but we don’t seem to have the same reaction when we walk into a supermarket! Our shopping needs subvert that awareness until later. But when I looked at the flow in and out of my household, I really got some perspective on what I buy, use, and discard. Remember that news story that China was turning away plastics for recycling? That had to do with the degree of contamination in the shipments. Contamination means two things: one is foreign material in with the plastic like paper or metal or left-over food in containers, and two, is different plastics mixed together. The contamination level of a shipment affects whether the recycling industry can effectively use the recyclables or whether they need to adjust their processes to do so, or sort things further. China changed the degree of contamination they were willing to accept because it was too much work at that end. The Separation of recyclables determines what the market will pay and even whether the market will exist. Sorting and putting ‘like’ with ‘like’ is not difficult. There are maybe just 10 plastic categories. Even though it’s not hard to do, it took time for me to really embrace it. It felt like the pitch of a clean, convenient, and “all-new” economy was going back on its promise. The problems were hidden and the nuts and bolts of what to do with stuff is now playing out more plainly. And the markets show that the consequences of doing it sloppily are real and substantial: the recycling flow ends up as garbage. Separation of recyclables determines what the market will pay and even whether the market will exist. In the book, Junkraft, scientist Marcus Eriksen detailed his Pacific Ocean expedition on a homemade raft of plastic waste. He was out for weeks, running experiments, collecting samples, and raising awareness. Now founder of the 5Gyres.org Institute (there are 5 massive gyres of plastic waste spiraling around in the world’s oceans), Marcus and his team educate and advocate to get plastics out of the oceans. I don’t live near the ocean but there’s a mighty river nearby and guess where that goes? There’s a massive supply of plastic but public pressure is getting traction. Some cities are instituting bans. Boston has banned plastic bags. Montreal, the first Canadian city to take a step, joined them this year! Culver City has banned plastic bags and polystyrene. It’s catching on. In Whitehorse, some stores don’t offer plastic bags. Paper straws are back. Cloth bags and travel cups are on hand. I look for ways to decrease the need for single-use plastics and to keep the sorting sorted.